Here at Deremer Studios, we’re grateful for the sacrifices and suffering the men and women of our armed services endure for the sake of our freedom and the freedom of those around the world. It is an honorable effort and a worthy cause. As a small token of our appreciation, we’ve uploaded six desktop backgrounds (1920×1080 – Full HD) in honor of Veterans Day. 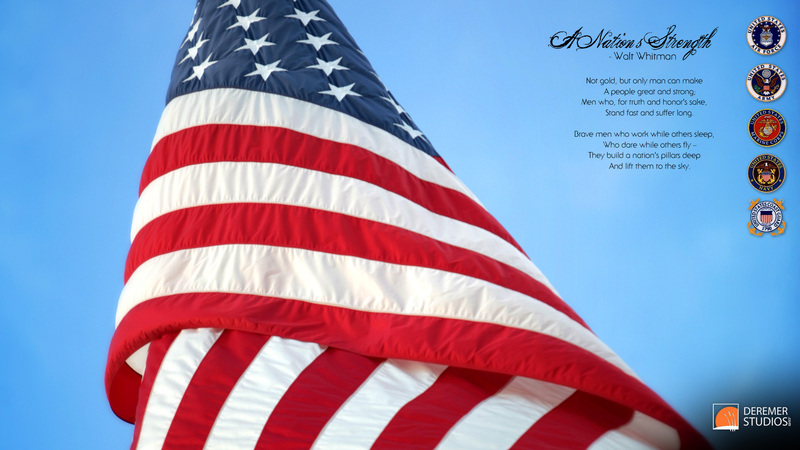 Enjoy and Give Thanks to those who have given so much! If you’ve followed us for any time, you probably know I am fascinated and moved by the heroes and horrors of the American Civil War. 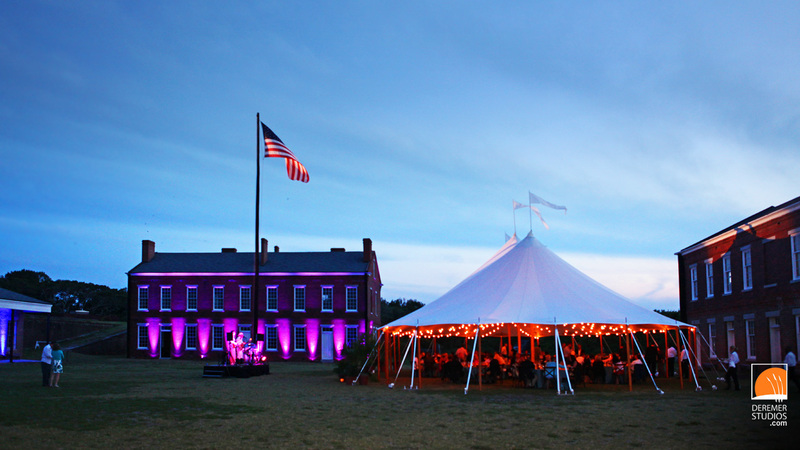 Last week, we had the pleasure of shooting an event for Inovalon, which included a beautiful evening at Fort Clinch, a Civil War-era fort on the the northern tip of Amelia Island. 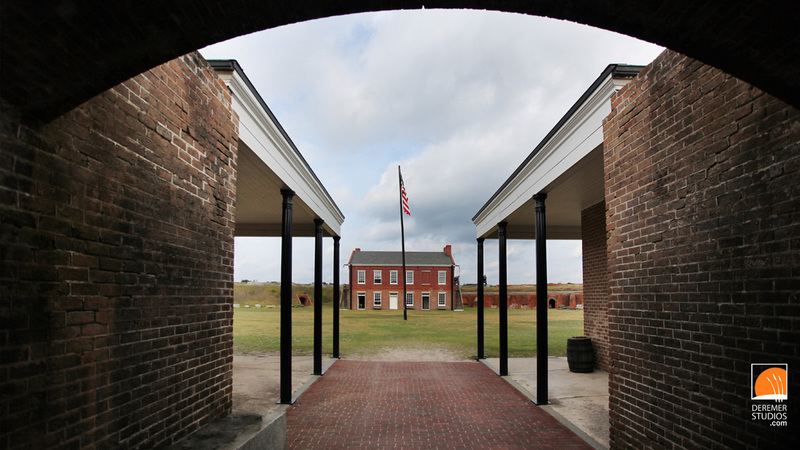 The fort itself has a relatively bloodless, but none the less fascinating history that I always enjoy. 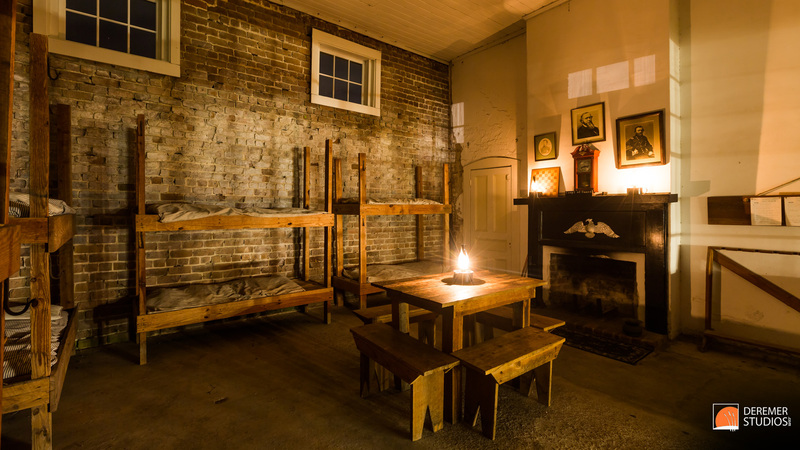 To learn (and see) more about the fort, please feel free to visit our post on the 150th Anniversary of Union capture of the Fort. But back to this shoot – while there I had the opportunity to capture some fine art images for our client as well as the typical event photos we provide. The evening looked like rain, but by dusk a sliver of sky was lit ablaze by the setting sun, making for some amazing conditions for that Ken Burns style of sunset photography you may have seen during his documentary, The Civil War. 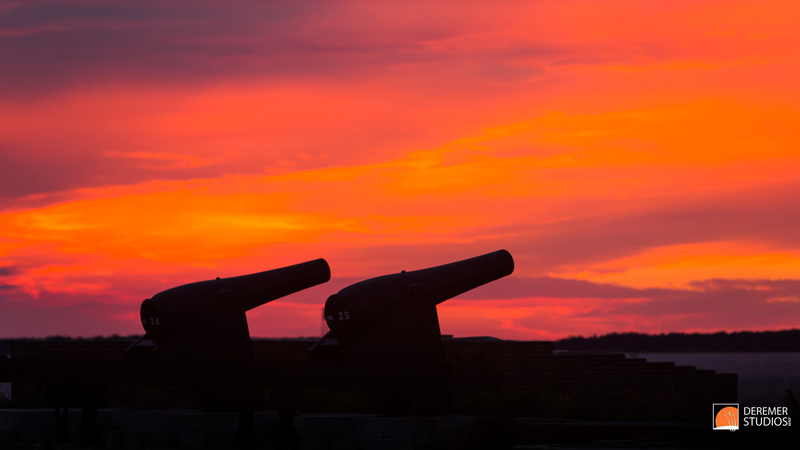 The group was also treated to a pair of twilight field artillery firings courtesy of the a great group of civil war reenactors attached to the fort (below). As always, feel free to share, download and enjoy! All images are 1920 x 1080 pixels – perfect for 1080P HD wallpaper for your computer! After a wonderful trip to New England, it was reluctantly time to head south. 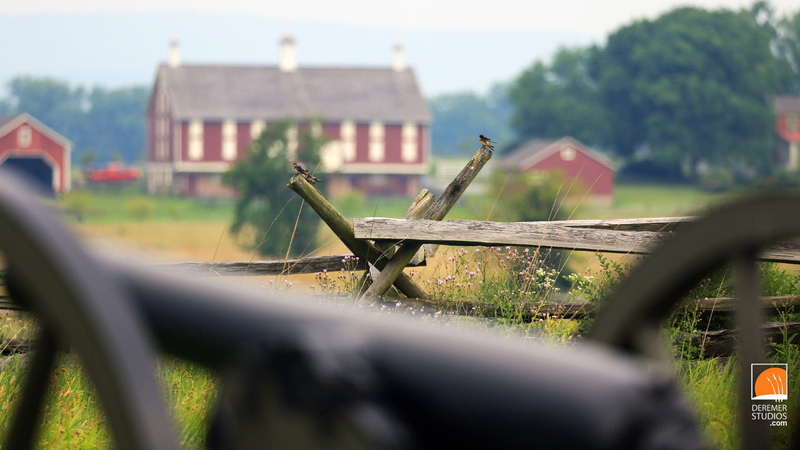 Instead of more or less tracking along interstate 95, we took a detour to the pastoral Pennsylvania farmland to visit Gettysburg. Though we were not able to make the 150th anniversary, we arrived at the tail end of the week marking the pivotal battle of the American Civil War. 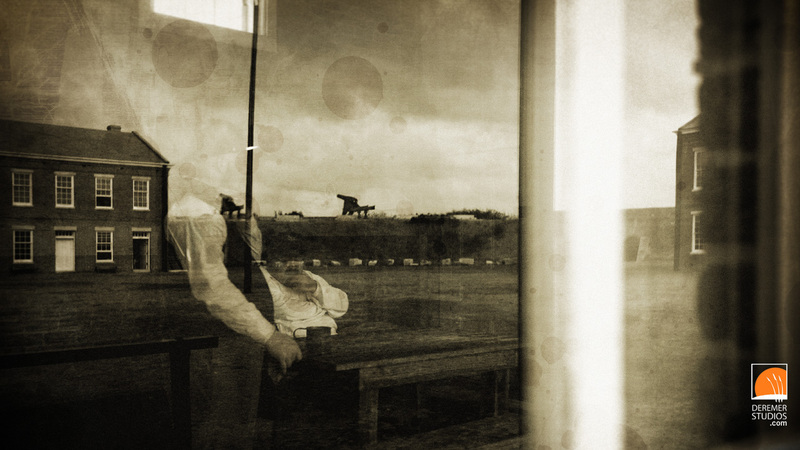 As a photographer and graphic designer, the history of the above 1863 photo, superimposed onto one of my own photographs, is fascinating and scary. If you thought photo manipulation was a modern invention, you would be wrong. Today, it’s a simple task to take a photo, add a person here or remove a piece of the background there. 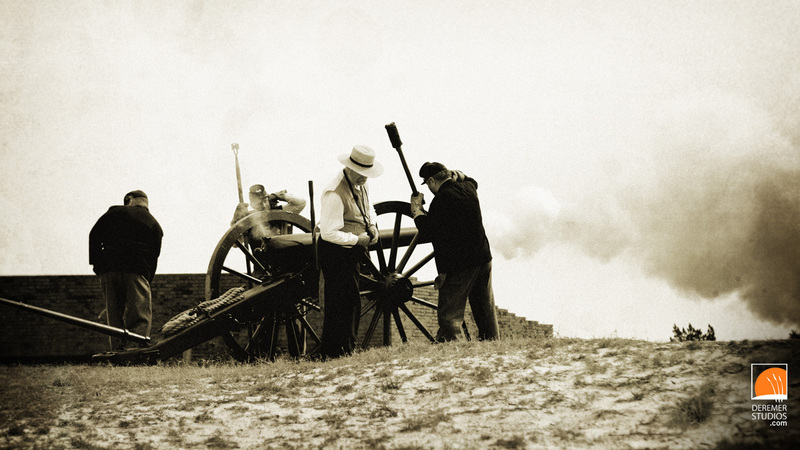 But in 1863, battlefield photographers had their own approach. The dead man in this famous picture “The home of a Rebel Sharpshooter” , captured by Alexander Gardner has recently been discovered to be a staged photograph. 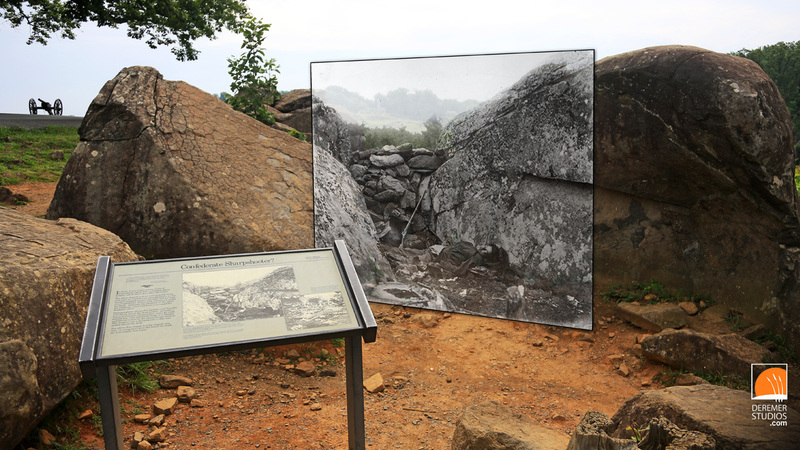 The soldier is believed to have fallen over 300 feet away, his body along with his rifle (not a sharpshooter’s rifle as the title would suggest) were moved by blanket to this pile of defensive rocks raised between two boulders in Devil’s Den. 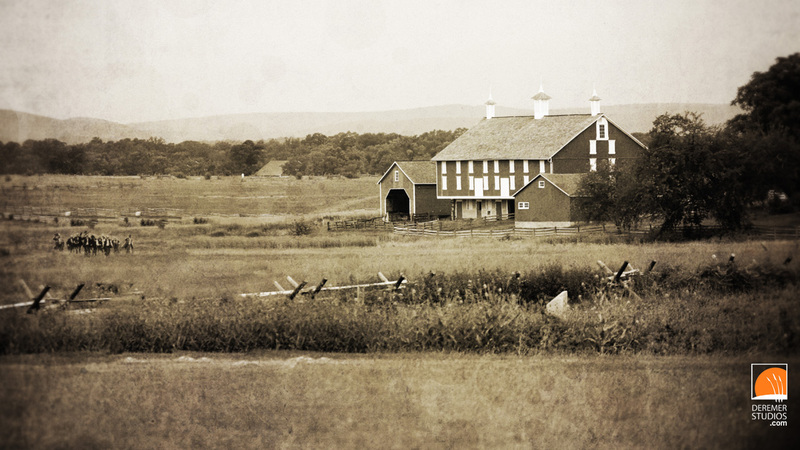 In total, over 170,000 troops amassed to wage war in the sleepy little farm town of Gettysburg, PA. It all began on July 1st, 1863 when confederate troops descended from the north, while Federal troops amassed from the south. When the battle ended three bloody days later, 7,863 men lay dead in the fields, and another 27,224 wounded were spread throughout the region in churches, schools, barns and homes converted into makeshift field hospitals. The above two photos capture the area known ever since the was as The Angle – the site of the last desperate Confederate push to turn the day. With the Federal troops positioned on a rise, with fences and a stone wall between them and the advancing Confederate line, it was a bloodbath. The Confederate losses were staggering – the casualty rate was over 50%. Pickett’s division alone had 2,655 casualties. It was a bloody affair. Though our visit was all to quick, the somber memory and ghostly quiet of the battlefield will stay with me for quite some time. And, on a brighter note, enjoy the photos – and of course, feel free to download as HD desktop wallpaper below! Last week we had the privilege of spending several days at the Ritz-Carlton, Amelia Island with a great commercial client. The resort not only provided some wonderful meals and amazing service, but they also coordinated a selection of great activities. 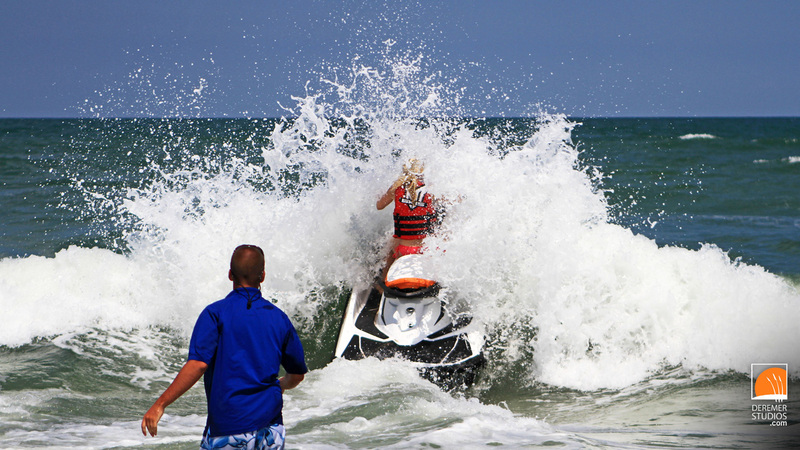 In this post, I’ve highlighted jet skiing and sailing, as well as an amazing reception at the historic Civil War site – Fort Clinch. Enjoy the photos! Just today, we had the opportunity to shoot another signature Fernandina event for the Amelia Island Tourist Development Council. 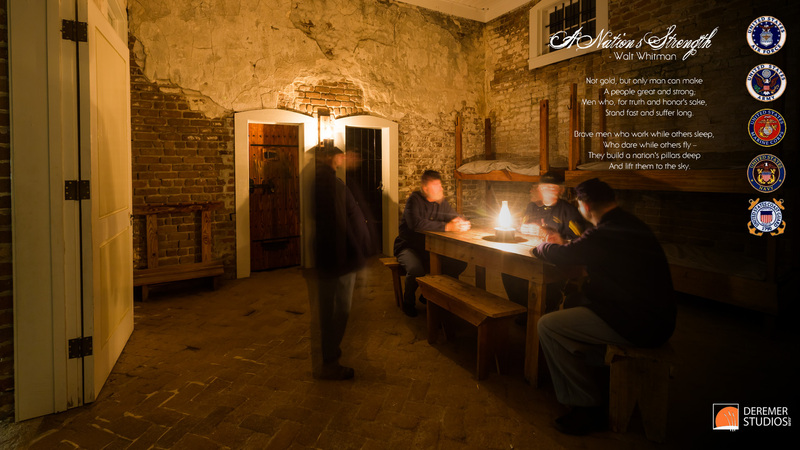 This time, we visited Fort Clinch – a Civil War era fort that 150 years ago today, was occupied by union troops (and remained in union custody until the conclusion of the war). On the first weekend of every month, you’ll find more than your average tourist walking around these ancient ground. In fact, you’ll be surrounded by troops, doctors, shop keepers, and a slew of other folk straight out of 1862. Along with a large contingent of other guests, we spent the morning with these dedicated folks, learning much about life in the 19th century. 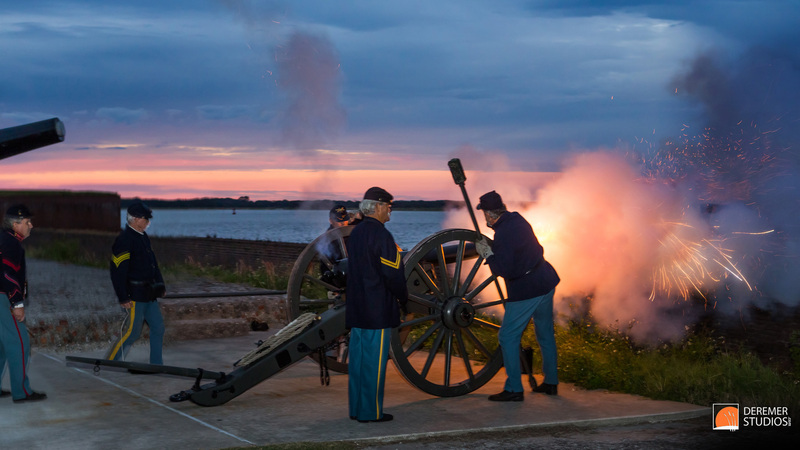 From the joy of dental work (the patient had to use a foot pedal to power the drill), to soldier life in the south before vaccines, to live cannon firing demonstrations (below), the morning was certainly a treat! Being a history buff myself, this trip was especially enjoyable for me. Inspired by the day, I decided to do a little extra work on several of the photos to give them a period feel (above and below). To do this I created vignetting on the sides, added a progressive blur toward the outsides, and did a slight textured overlay to make it all come together. I thought the finished product turned out well. Also – neat fact. As you may know, i grew up in NH. While talking with one of the park rangers, come to discover that the granite used in the construction of the fort is no other than NH rock! Pretty cool stuff. Anyway, here are several of our favorite photos from the day – as always, downloadable as HD desktop wallpaper. Enjoy! Want to see more of our commercial work? Check out our full portfolio at deremerstudios.com/events.html.